Are your kids preparing for the North Carolina End-of-Grade Tests? Also known as NC EOG, these North Carolina standardized tests are used to measure the progress of students from 3rd grade to 8th grade. Results from the NC EOG tests, and NC End-of-Course (EOC) tests for high school students, provide actionable data that will help parents, teachers, and students improve academic performance in reading, math, science, writing, and other subjects. The North Carolina Testing Program also uses NC EOG and NC EOC to determine each school’s Adequate Yearly Progress (AYP) as required by the federal No Child Left Behind Act (NCLB). Time4Learning, an online service that teaches many of the skills that these exams test, offers this page to help you understand the North Carolina End-of-Grade Tests and NC End-of-Course Tests, and how you can help your children prepare. The NC End-of-Grade tests are aligned to North Carolina State Standards, which define what students should learn each year. The NC EOG reading test and NC EOG math test are given to students in 3rd, 4th, 5th, 6th, 7th, and 8th grades, and measure how well they are meeting grade-level expectations. Fifth graders and eighth graders also take the NC EOG science test. 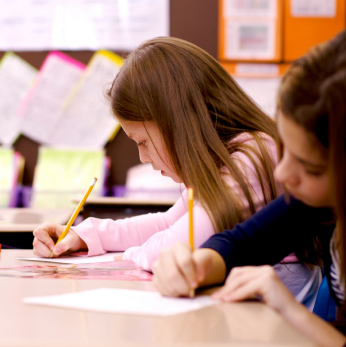 The North Carolina Writing Assessment is administered in 4th grade, 7th grade, and 10th grade. In addition, all students take the North Carolina Test of Computer Skills beginning in eighth grade and must achieve a proficient score to graduate. All North Carolina high school students take End-of-Course (EOC) tests to assess their mastery of the content areas as mandated in the North Carolina Standard Course of Study. NC EOC tests are given in algebra I, algebra II, English I, biology, civics and economics, U.S. history, geometry, chemistry, physical science, and physics. Students must score proficient on the five essential End-of-Course tests: Algebra I, Biology, Civics and Economics, English I, and U.S. History in order to graduate. North Carolina uses a broad range of assessments that promote learning for all students. With the goal of leaving no child behind, North Carolina offers alternative tests for struggling students, including the North Carolina Competency Test, which is given to 9th grade students who did not score at or above the proficient level on the 8th Grade NC EOG tests. The North Carolina NCEXTEND is designed to measure the progress of students with severe disabilities who require special accommodations. Students with Limited English Proficiency take the ACCESS for ELLs®, which measures their progress in English language acquisition. North Carolina also participates annually in the National Assessment of Educational Progress (NAEP), known as the Nation’s Report Card, where a sampling of students (from grades 4, 8, and/or 12) are tested in several content areas as part of a nationally representative assessment of student performance. The North Carolina EOG, EOC, and NC Competency Test are standards-based, criterion-referenced tests. Students compete only with themselves and are measured by how well they have mastered grade-specific skills. The NC End-of-Grade and NC End-of-Course tests are scored on four performance levels, with Level 1 being the lowest and Level 4 the highest. Students scoring at or above Level 3 are considered to be proficient. The North Carolina Test of Computer Skills and the North Carolina Competency Tests are scored on a pass-fail basis. North Carolina’s goal is for all students to pass the tests and allows tests to be retaken. A good resource on the North Carolina Testing program is the NC Department of Public Instruction website. For general tips on test preparation, please visit our standardized test overview page. The real preparation for the NC EOG, NC EOC, or any standardized test, begins with your commitment to your children’s education throughout their school years. All families should devote time and effort to helping their students learn, starting with making sure that homework gets done and reading every day becomes a habit. Many families also employ tutors or an online learning program, such as Time4Learning, to build fundamental skills. In addition, families use test prep programs or books to help their children become familiar with test formats and time restrictions, learn test-taking strategies (when to guess, when not to), and practice strategies for different types of questions. For instance, in the case of a reading passage followed by comprehension questions, many test prep programs teach students to scan the questions prior to reading the passage so that students will know what areas of the text require close reading. Time4Learning is not a test prep program, it is a program that builds the skills that will be tested.